Connecting high-speed LAN systems while maintaining full network speeds can be accomplished by using high-performance infrared (IR) optical LED/laser technology. 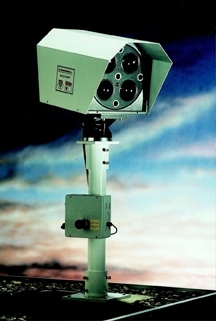 Flight Transport systems offer a complete series of next generation wireless line-of-sight IR communication solutions. The Flight Transport systems result from 30 aggregate years of research and development in the field of IR communications. Using the right combination of LED/VCSEL/LASER transmit/receive boards, IR systems can be tailored for your specific speed and distance requirements. Whether you are an enterprise or service provider, whether you need 10 Mbps or 2.5 Gbps, whether your application is SONET, Fibre Channel, IP or ATM, whether you want to transmit video, voice or data, whether you want to deploy ring, mesh or point to point, whether you have roof rights or you prefer windows, an FSO approach can address your optical connectivity needs with the FlightTransport product line. Deployed in more than 30 countries, the Flight FSO products provide the broadest options for Carrier and Enterprise network connectivity up to 2.5 gigabits per second. We provide an array of products to address your price points and desired performance requirements. FSO solutions combine three essential elements that meet the needs of both Enterprise and Carrier customers. Flight FSO products deliver optical connectivity faster and more cost-effective than fiber-optic cable or microwave radio. We offer three transport choices – FlightLite, FlightSpectrum, and FlightStrata – all with features and performance to meet a variety of customer needs. The outdoor wireless solutions have earned high marks in Enterprise networking installations for linking two or more buildings in classic LAN-to-LAN backbone connectivity with extraordinarily high-bandwidth of up to 1.25 Gbps. InfoWorld recently rated the Optical Wireless products above competing unlicensed radio frequency competitors, thanks to the products’ full line speed capability and operational range. Mobile carriers can accelerate momentum for 3G and 4G networks by deploying the outdoor wireless solutions for mobile wireless backhaul connectivity in place of low-bandwidth leased lines or licensed and unlicensed RF. Copyright © 1997 - 2019 Laseroptronics. All rights reserved.